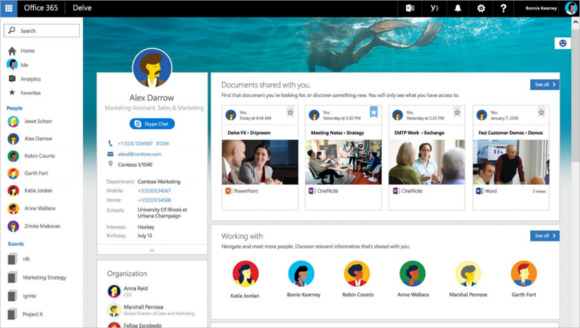 The profile pages, most accessible through Microsoft’s Delve product, show a large photo of the worker, along with the files shared between that person and whoever is viewing their profile. The new feature, announced Tuesday, is a way for people to get a sense of their coworkers’ responsibilities, even if they don’t work in the same office. 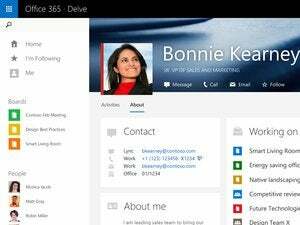 An Office 365 user’s profile also shows who they work with inside an organization, allowing the viewer to get a sense for how someone else fits into the business. The new experience replaces a somewhat unwieldy two-page profile that Microsoft currently uses in Delve. Right now, users can see the files that someone else shares with them when they open up that person’s profile, but have to switch to a different tab to get contact information. When people look at their own profile, they’ll see the documents they’ve worked on recently. Companies that have opted to get Microsoft’s First Release updates for Office 365 will get the new profiles first over the next several weeks, and everyone else can expect to see the pages by the second quarter of this year. It’s all part of Microsoft’s continued emphasis on helping people collaborate at work. Office 365 is focused on not only providing standby tools like Word and Excel, but also on new collaboration services that tie them together through features like real-time co-authoring.